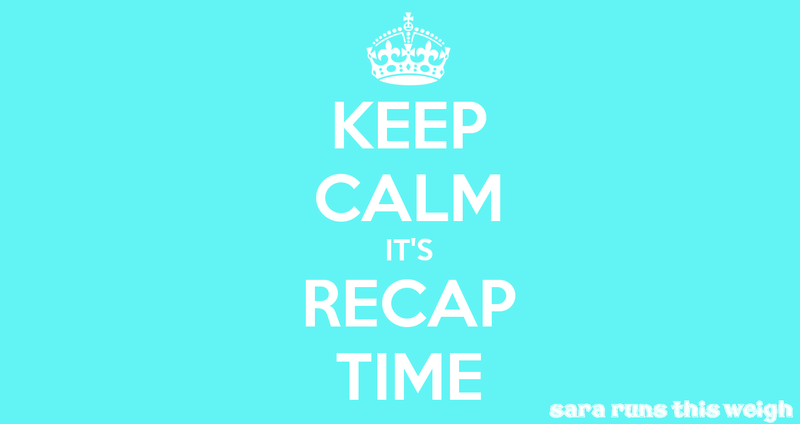 I had a great week last week as I’m sure you discovered when you read last Saturday’s recap! 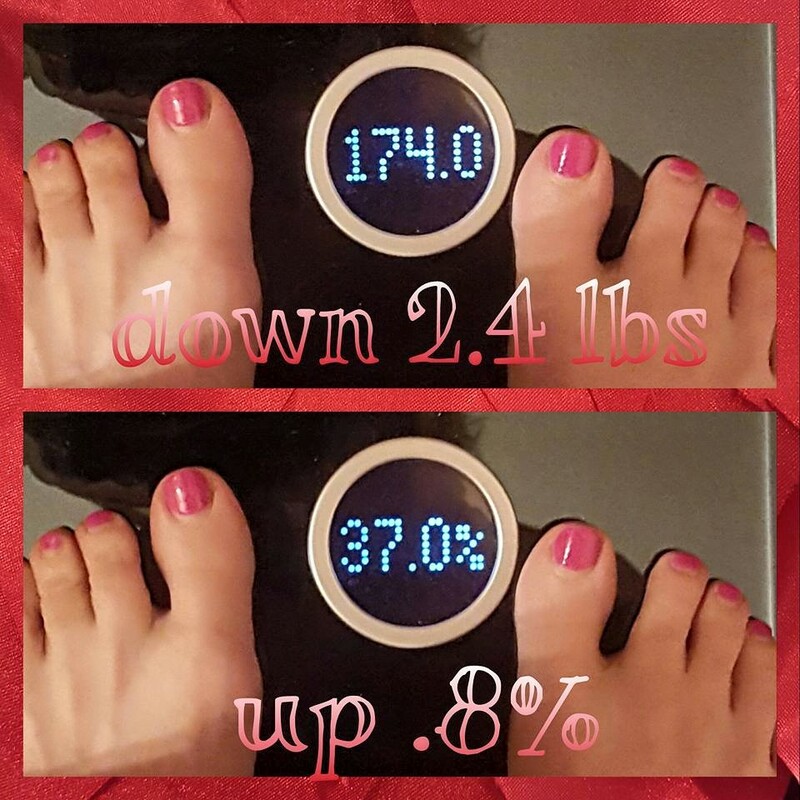 I brought my A-minus game (let’s be honest here, I could have brought it a little more than I did, even with the limitations the boot puts on me) and knocked out almost 3 pounds on the scale with last week’s weigh in! I didn’t want to undo what I achieved, so I strove to continue with AT LEAST an A-minus game all this week as well. As I mentioned last week, I also changed up my food ever so slightly. 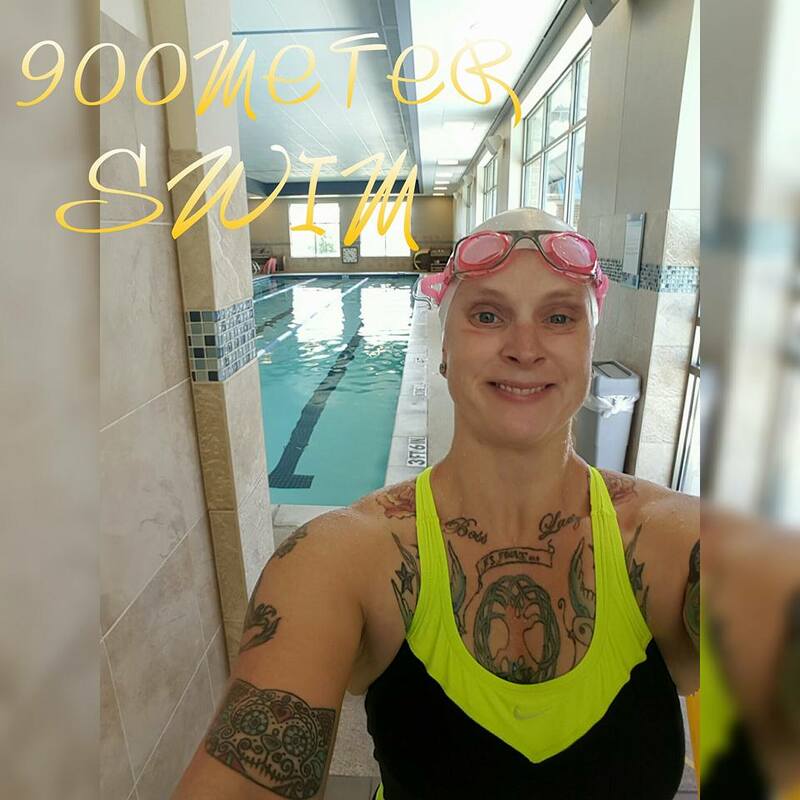 • Saturday: I had to make up my 900m swim from Friday, so I made sure I got that done. I had actually decided while doing my laps that I would bump up to 1000m, but my foot kept cramping so I just finished my 900 and called it a day. When I got home, I walked around my apt complex for 2.5 miles. • Sunday: Sunday-funday! Schlangin’ some kettlebells is what I do on Sundays, yo! And got me a new shirt to sport while doing it too! “Getting my kettlebell on.” You know it! 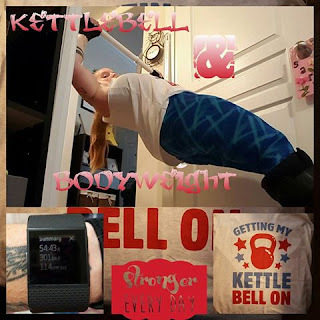 Just like last week, I added the circuits of the bodyweight exercises plus a plank hold at the end to my kettlebell rounds. I decided to add something else to this workout to make it EVEN BETTAH! What could that possibly be?!?!?! Pull ups! Well, modified pull ups. I have to work my way back up to doing full-blown-from-a-dead-hang-pull-ups again. But my pull up bar adjusts and I can do modified pull ups, so that’s what I’m going to do until I can start doing them from a dead hang! I did as many as I could do with each round of the kettlebells…basically, until failure. That ended up being 10 reps each round, so a total of 40 modified pull ups! • Monday: I’ve seriously got to come up with a better name for this workout other than the “creative gym session.” That sounds so…meh. Shoot me your ideas! Had physical therapy again and that went great! I was with the 3rd different therapist in 3 visits…HA! I like all the therapists I’ve worked with so far. They’re all super nice and knowledgeable. This visit was with Amy and she’s a runner too! 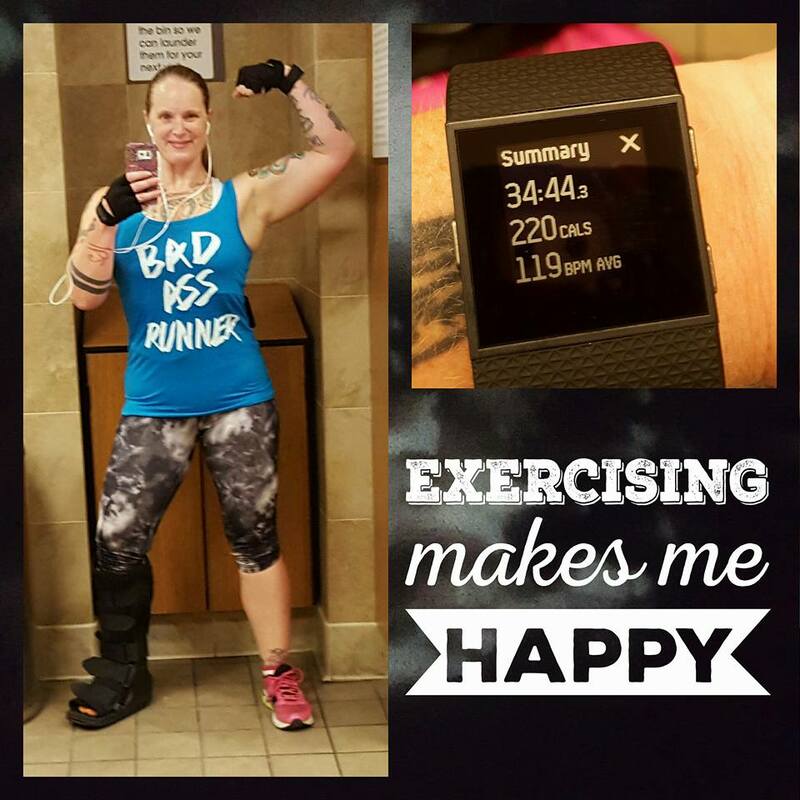 My 30 minute session went way to fast because her and I talked running the WHOLE TIME! It was awesome. I needed that. And I hope I have more sessions with her for this very reason. • Tuesday: [mental] therapy day! I’m a little loathe to park at my work parking garage for fear that someone might see me walking around and think that I’m faking or whatever and that I shouldn’t be out on medical leave. So, instead of walking before and after my appointment for extended periods, I opted to park super early so I could do my entire walk pre-appointment. Any further walking I might want to do post-appointment, I can just go somewhere else to do. I parked at Whole Foods in their underground parking garage. 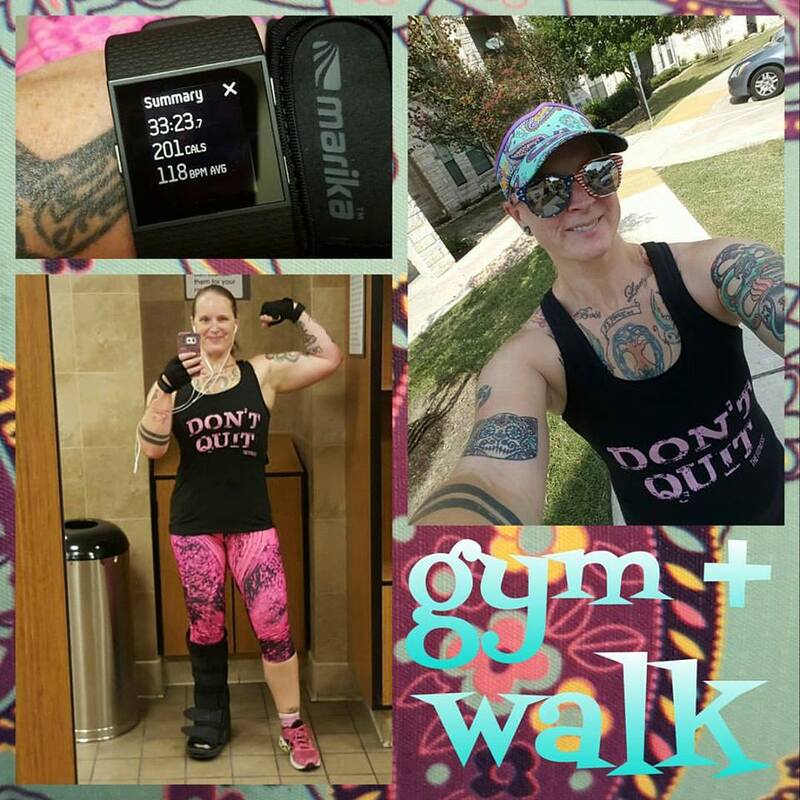 I walked about 2.2 miles pre AND post appointment. Very nice. Then I went and got Monday’s swim done! 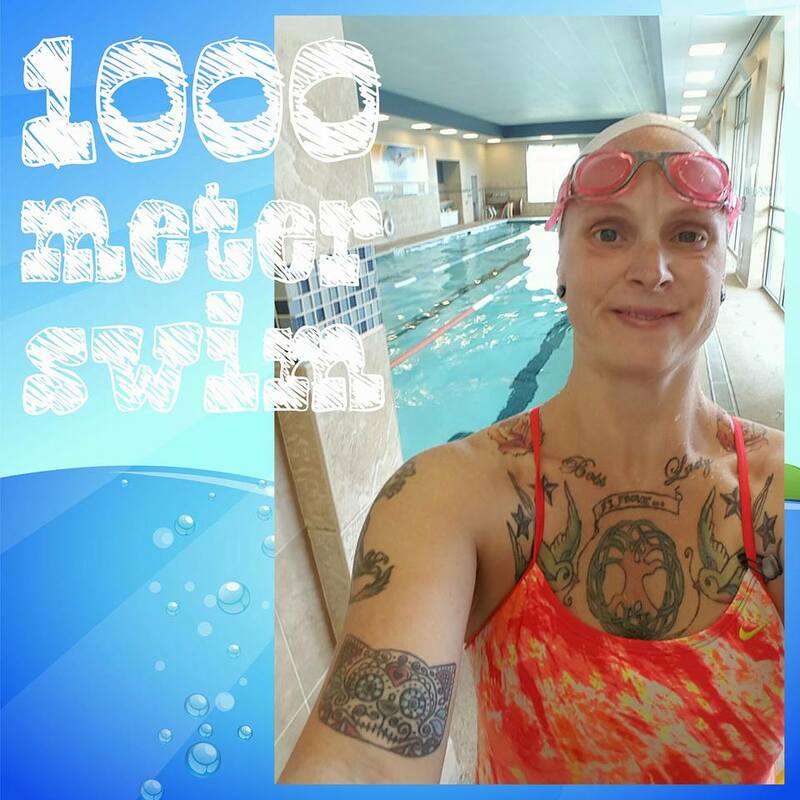 1000 meters baby! I thought about going longer because I still felt great when I got done with the 1000, but decided against it because I was scheduled to swim again on Wednesday. • Wednesday: headed to the gym and knocked out my upper body + abs machine workout. It was of course followed up by a swim. I decided I’m going to start seeing how far I can go in a set amount of time. The time will change each week by me adding 2 minutes. So, this week’s goal time is 28 minutes. I swam 1100m in 29 minutes this day! Woohoo! Next week my goal will move up to a minimum of 30 solid minutes in the pool. Obviously, I finish out the lap I’m already swimming when my minimum time hits, which is why I went 29 minutes instead of just 28. I had another PT appointment this day. 2nd appointment with Amy the runner. YAY! She had me doing squats while standing on the squishy AND the solid side of a BOSU ball. Dude, I need a BOSU ball. I’ve said it in the past, but I seriously mean it now. When I’m cleared from the boot, I totally want to do BOSU squats with my Sunday funday workout! Alas, they’re not cheap. Maybe I can find one for a good deal on CraigsList? Hmmmm. • Thursday: I had another follow up with my primary doc this day and that went alright. He had me do a little walking while he watched and then had me bend my ankle to the side to see if it hurt. And it DID. He said, yep, 2 more weeks in the boot. I was kind of hoping he was going to say that I could come out of the boot and wear a stabilizing brace instead. Oh well. I took this day as a rest day. 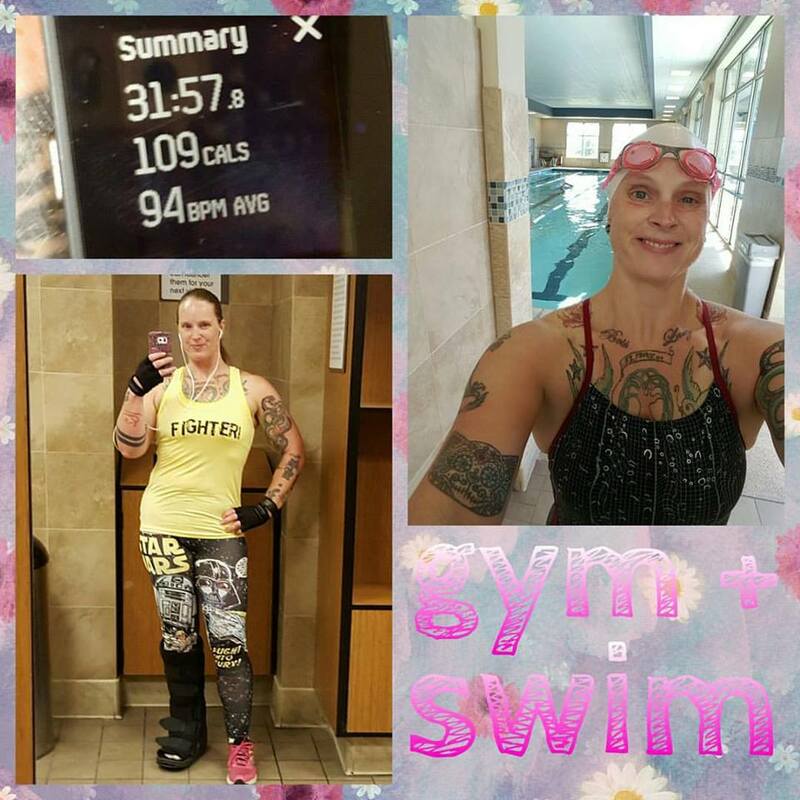 I figured that since the closest I had gotten to a rest day was Tuesday where I walked a lot and then swam, but I hadn’t actually taken a rest day this week, so I figured that I probably should take one…so I did. • Friday: hit the gym for my second round of the creative workout for the week, followed by a 3 mile walk. Even though my shoulders weren’t as “trashed” as they usually are on creative workout days due to the TRX exercises, there was a bunch of people in the pool and the area around it, plus a couple more ladies made their way out to the pool area as I was accessing my locker post-workout. Picked up my packet for tomorrow’s Fight Like A Girl (FLAG) 5K. Proceeds benefit melanoma cancer research. It will be the second time I walk a race. Such a humbling experience let me tell you. But it doesn’t get me down. I am just doing things at my current ability and there’s nothing that can be helped about that. Just accept it! I do now wish I hadn’t paid the extra $10 for a timing chip, though. Oh well, I registered pre-injury…how was I supposed to know? Also, this week, I earned a new FitBit badge! 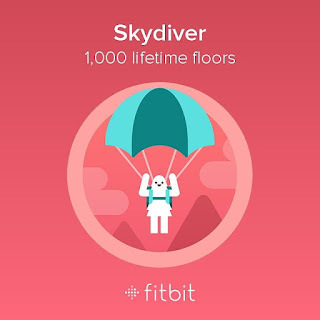 The Skydiver badge for climbing 1000 lifetime floors of stairs! Woohoo! I do love my stairs. For dinner, I like to keep it light and less than 150 calories, so I decided to go with a half acorn squash for dinner each night. I seasoned them simply with some cinnamon and a packet of stevia. But then my mom told me about Truvia brand stevia brown sugar blend. I found it online and I bought it and started using that on my acorn squash instead of the plain stevia. (update: my friend Amanda found it locally at the HEB grocery store, so I can buy it locally now instead of ordering it online and essentially paying twice the price because of shipping costs.) A half of an acorn squash was the perfect amount of food for dinner…maybe even bordering on almost too much just because I’m so used to eating so small at dinner now. I stuck with the creamy fluffy scrambled eggs made with the lite coconut milk for my breakfasts. After some reading I did last week, I discovered that I’m doing something called intermittent fasting purely by chance. I had no intentions of doing this, nor did I actually know what it was. But, apparently, I’m doing it. One of the best side effects of intermittent fasting is that it helps control hunger urges. Yea it does! I barely even think about food anymore. I love it! One of the things I hate the most about having an eating disorder is the almost constant obsessing about food. I’m not saying it’s gone, because it’s not. It’s just that RIGHT NOW I’m not having a problem with it. Soooooo, what we’re all waiting for, I’m sure, is this week’s weigh in! How did my continued efforts to keep up my activity levels and my food switches show up on the scale? Well, let’s check that out right now! I have to say, I am super happy that even with as close as I am to my goal weight that I’m still able to pull a weekly weight loss number like 2.4 lbs! I am a little, but not big time, concerned that my body fat percentage keeps creeping up each week. But then, also, when I look in the mirror I do still have some “fluff” around my middle (it pretty much hangs out around my belly button like a donut). This may cause me to rethink my goal weight, but I’ll decide that once I’ve reached 170. If I do readjust my goal, it will only be by 5 lbs, down to 165.